After the IEP meeting~What to expect + what parents need to do. Home » IEP Advice for Parents » After the IEP meeting~What to expect + what parents need to do. 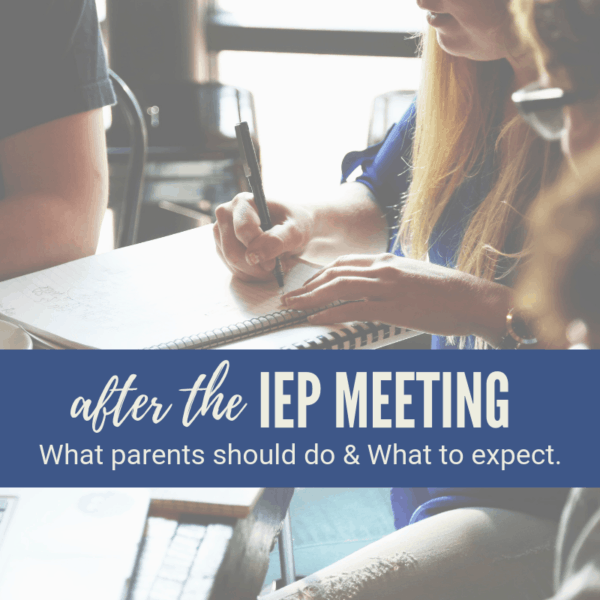 What Parents should do AFTER an IEP Meeting. It seems that many parents anticipate and prepare for an IEP meeting and then that’s it. Often, it’s very anti-climatic, all that preparing and worrying. And then what? Are you left with this feeling of not being resolved, or not knowing what to expect? Sound familiar? Also read: How to NOT STRESS about your IEP meeting, seriously. Let’s go over what to expect after the IEP meeting. Because I have to say it. You knew I was going to, right? Ideally, the IEP meeting itself is not the end-all, be-all of your child’s IEP process. If you, the parent, are actively and fully participating in all five parts of the IEP process. Right? RIGHT? If you are, trust me, the IEP meeting and the whole process itself will go much smoother. If you continue to basically only participate in some communication and the IEP meeting itself, the meetings will likely continue to be long, taxing, draining and exhausting. When you take part in all five parts and have open communication with the team, there are no surprises or real battles to be fought during the IEP meeting. Those have already taken place. During an IEP meeting, the discussion should really focus on a few topics. That’s really it. So, you can see from that list, if you participated in the evaluations portion of the IEP process, there should be no surprises in that area. I have said this a zillion times out loud and in texts, emails, and on social media. 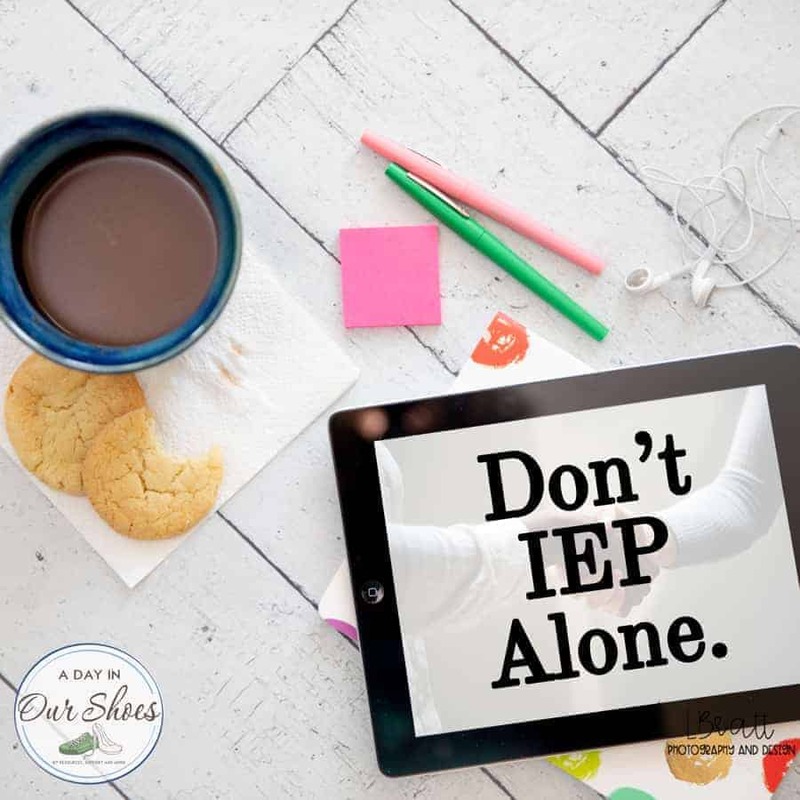 There is one super important, necessary thing that EVERY PARENT MUST DO after their IEP meeting. You should do this after every meeting you have with your child’s team. This way, there are no surprises when you receive the final IEP. Most IEP parents I know do not do this. And yet, all of them should be. No, I don’t mean going home and drinking wine and crying. We all do that, doesn’t mean we should. Get an IEP OrganizerYou need to do a brain dump and write a letter to your IEP team leader. Remember, in IEP land, it is all about the paper trail. If you didn’t write it down, it didn’t happen. Take your notepad, grab a hot cup of tea and go to your computer. Now sit down and do a brain dump. Simple. It puts the ball in their court. If they do not refute anything that you have said, in the eyes of the law, it stands as truth. You have let them know that you expect a PWN with all of the items on it, and you were not confrontational about it. Should your IEP arrive with missing items, or items on it that are different than what was discussed, you have some data to refute it. If the team ran out of time and needs to meet again, that should be decided while you have everyone at the table. Otherwise, when you do your recap email, put in it your available dates and times. Print off your IEP organizer and box up the old one; put new IEP files in your new binder with new dates. Ask when you will receive a copy of the IEP. Some states clearly define a time, others do not. Check your state’s regs for specifics. If your state does not clearly define it, I’d say a week or two is a courtesy. If it was not defined during the meeting, ask when the new IEP will start to be implemented. Make sure that the person printing and sending the IEP is aware that you are also expecting a PWN with it. This is an item to include in your recap email. Follow up on any items you were to follow up on–such as calling specialists or getting outside reports or something. Ask for your Permission to Evaluate form, if, during the meeting, the team decided that they were going to do more evaluations. Ask what you need to do, what forms you need, to enroll your child in any programs that were decided upon during the meeting. Send an email to whoever sent it to you. “Dear IEP person, I received the final draft of son’s IEP today. I will be likely using the full 10 days to review it, so I will send you any necessary correspondence by (include date that is 10 days from now).” This way you will get the full 10 days from which you received it, and the email you are sending is acknowledging what day you received it. Compare it to your recap email. Is everything in there? Is there a PWN? If not, you need to send another email: “Dear IEP person, I received the final draft of the IEP today. However, there is no PWN form, particularly for items XY and Z which we discussed in the meeting. Would you like to send one, or should I just create one and include it when I send back the IEP?” Some states have official PWN forms, but they aren’t absolutely necessary. You can find lots of templates online. Get it back to them in a timely manner, either using certified mail or hand deliver for date accuracy and tracking. You will have to decide if you are choosing mediation or due process over disagreement items. And now you’re done. It would be great if the meeting was it. But the meeting is just one part of the process. Trust me, once you regularly stay on top of things, it gets much easier. « What happens if your child does not meet their IEP goals?